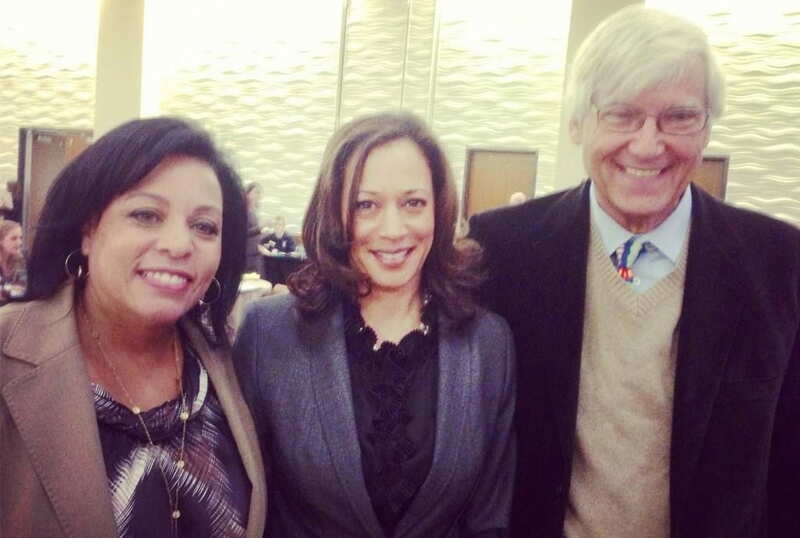 California Attorney General Kamala Harris (pictured, above center with Clothilde Hewlett, and Geoffrey Cowan) urged law enforcement officials, NGOs, and researchers in the fight against human trafficking to “dedicate [themselves] to the adoption of technology” at her Human Trafficking Leadership Symposium on November 16, 2012 at the University of Southern California. CCLP recently released its own report, The Rise of Mobile and the Diffusion of Technology-Facilitated Trafficking, which illustrates the increasingly important role of mobile in human trafficking, both as an instrument of traffickers and as a potential tool for law enforcement in combating the crime. Attorney General Harris’ keynote address echoed the themes of CCLP’s research. She noted that “the beauty of technology is the issue of the smart phone, [because] the technology is increasingly going to a mobile device.” The profusion of mobile devices can directly aide victims, who may be able to use mobile devices to call for help or to access help services on the Internet. As part of the symposium, one session featured CCLP research director Mark Latonero, who led a breakout session on technology and human trafficking. The session also featured Fred Wolens, Public Policy Manager at Facebook, Robert Morgester, Senior Assistant Attorney General, eCrime Unit, and Julia Cordua, Executive Director at the THORN Foundation. Featured speakers and guests at the day-long symposium were U.S. Secretary of Labor Hilda Solis, Mexico Attorney General Marisela Morales Ibanez, Los Angeles Police Department Chief Charlie Beck, Los Angeles County Sheriff Lee Baca, and Los Angeles District Attorney-Elect Jackie Lacey. i.Kamala D. Harris, “The State of Human Trafficking in California 2012,” (California Department of Justice, November 2012), 64.